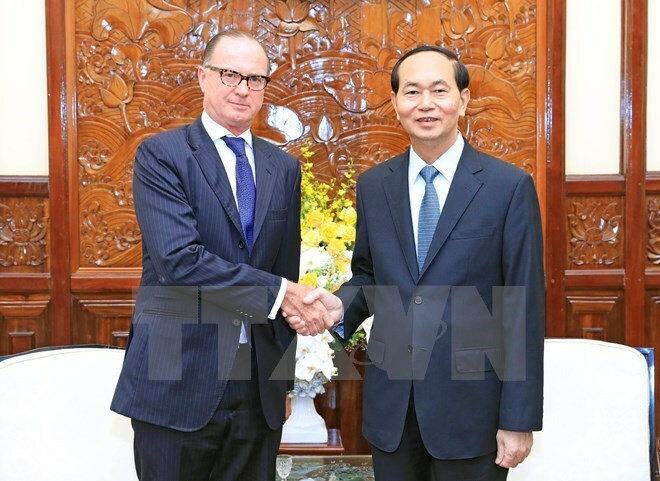 Hanoi (VNA) – State President Tran Dai Quang hailed Austria’s outgoing Ambassador to Vietnam Thomas Loidl for his efforts to step up bilateral ties and introduce many Austrian businesses to Vietnam during his reception for the diplomat in Hanoi on August 29. He congratulated the diplomat on his very successful working term in Vietnam and wished that in any future positions, he would always be a close friend and work to foster the cooperation between Austria and Vietnam. The President was delighted at positive cooperation between the two countries across politics, diplomacy, trade-investment, development cooperation, education-training, healthcare and education. He cited the 2016 two-way trade value of 2.8 billion USD, which is 10 percent more than 2015’s figure. Austria is the sixth largest European exporter of Vietnam. It is running 28 projects with a total registered capital of 138 million USD in Vietnam, ranking 39th among 116 countries and territories investing in the country. He took the occasion to thank the Austrian Government for providing Official Development Assistance (ODA) in the fields of railways, healthcare and vocational training. Austria-funded programmes and projects have been productively contributing to Vietnam’s socio-economic development and international integration efforts. He suggested the two sides boosting visit exchanges, especially high-level ones, together with cultural and people-to-people exchanges, and coordinating in celebrations of the 45th anniversary of diplomatic ties to further the bilateral ties. He asked the diplomat to convey his invitation to visit Vietnam to President Alexander Van der Bellen. President Quang also suggested Austria to urge the European Union (EU) to soon sign and ratify the European Union-Vietnam free trade agreement (EVFTA) as the document will open up new cooperation, investment and business opportunities for their businesses. Ambassador Thomas Loidl stressed that Austria has over the past 45 years proved itself as a very reliable partner of Vietnam and it focused on political ties and economic and trade cooperation. He agreed that the two countries should hold more high-level visits to enhance their relations while underscoring the important role of cultural cooperation and exchange. He was glad to see the two countries’ active collaboration at multilateral forums and thanked Vietnam for its support for Austria’s initiatives at international forums and organizations.